Hello friends, it has been a hot minute since I have had a chance to sit down and start blogging again. There has been so much going on these last few months, so here’s a quick recap to keep you all up to date with what’s been going on in House de la Herquarters. First up Christmas, New Years and Australia Day were all pretty amazing! The summer school holidays have also kept me really busy with the kids but I have enjoyed every single minute with the family. Henry, my little man started Kindy this morning hence why I am finally sitting here blogging uninterpreted. My kids are growing up too fast and I am so proud of the amazing people they’re growing into. Secondly I have been working on my new Graphic Design business. I can’t wait to share all the fun things I have been creating. Designing is my passion and it is what puts a pep in my step, so stay tuned to hear more about it once I finalise my website and tie up all the loose ends. Now back to our regularly scheduled programming. I’ve missed blogging and connecting with you guys (our wonderful community) so much! 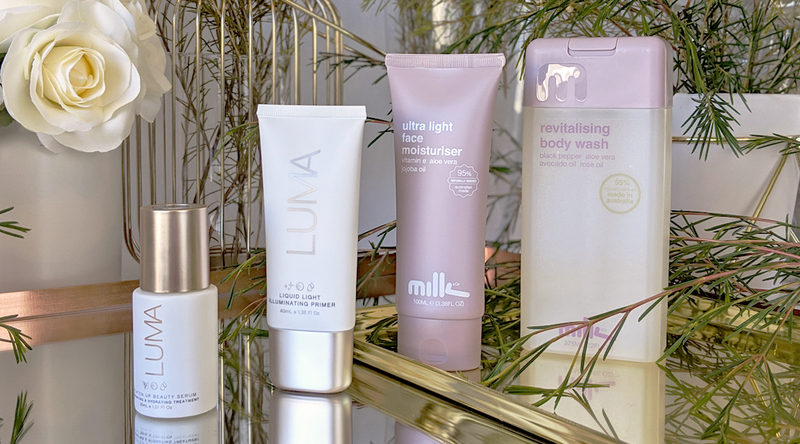 What better way to get back into the swing of things than to feature two fabulous cruelty-free Aussie beauty brands that are on high rotation in my skincare regime. Now without further ado here is LUMA and Milk & Co. The LUMA Liquid Light Illuminating Primer is a gorgeous multi-tasking primer that contains light-diffusing particles and crushed pearls. Enriched with vitamin A to regenerate and protect your skin, as well as moisture-boosting Vitamin E for a complexion pick me up and all day luminosity. I love that it gives me that perfect dewy base lit-from-within look that enhances my natural radiance. You can apply it directly to the skin or mix it with your SPF for added protection. Another LUMA gem is their skin-loving multipurpose Brighten Up Beauty Serum. It contains 99% naturally-derived ingredients including a combination of crushed pearl, vitamins C and E, Jojoba and Rose Hip. When used daily, this serum will work to nourish and soften the skin as well as illuminate the complexion providing long-lasting hydration. It has everything that your skin needs to keep it feeling amazing and looking more radiant. 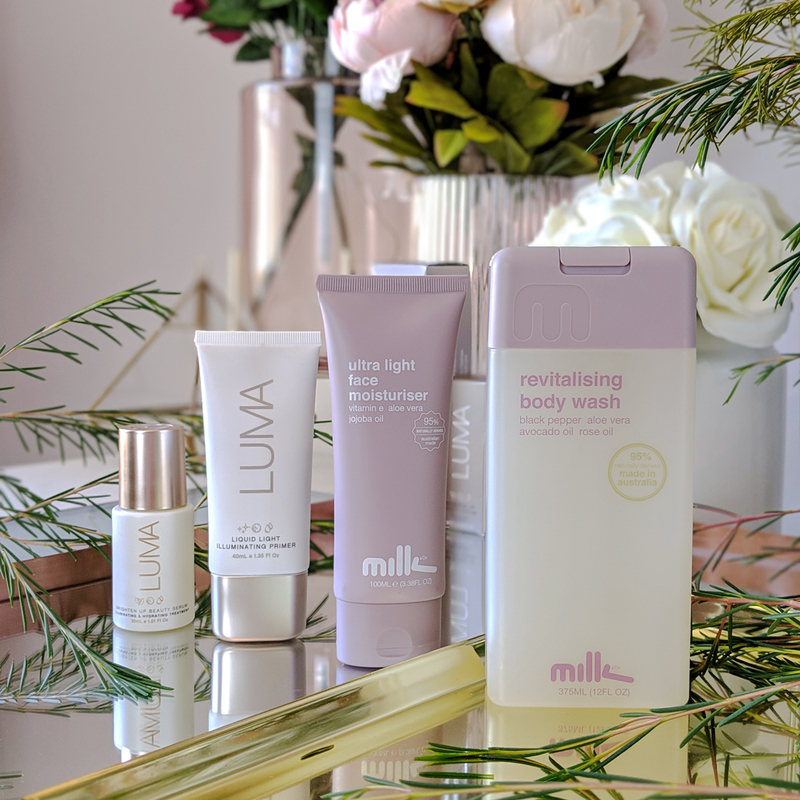 I have been enjoying Milk & Co products for a while now and their Revitalising Body Wash is another must-have bathroom staple. It’s a gentle foaming wash created to keep your skin clean, smooth and moisturised, leaving it delicately fragrant and refreshed. It is infused with antioxidant-rich and anti-aging properties of caffeine and black pepper, Avocado Oil, Rose Oil and Aloe vera. My skin feels great afterwards, clean, soft rejuvenated and supple. Bonus points for the planet-friendly 100 per cent recyclable packaging. Tip: Use a loofah or a washcloth to get a good lather. Plus, it’ll help scrub away dead skin cells. 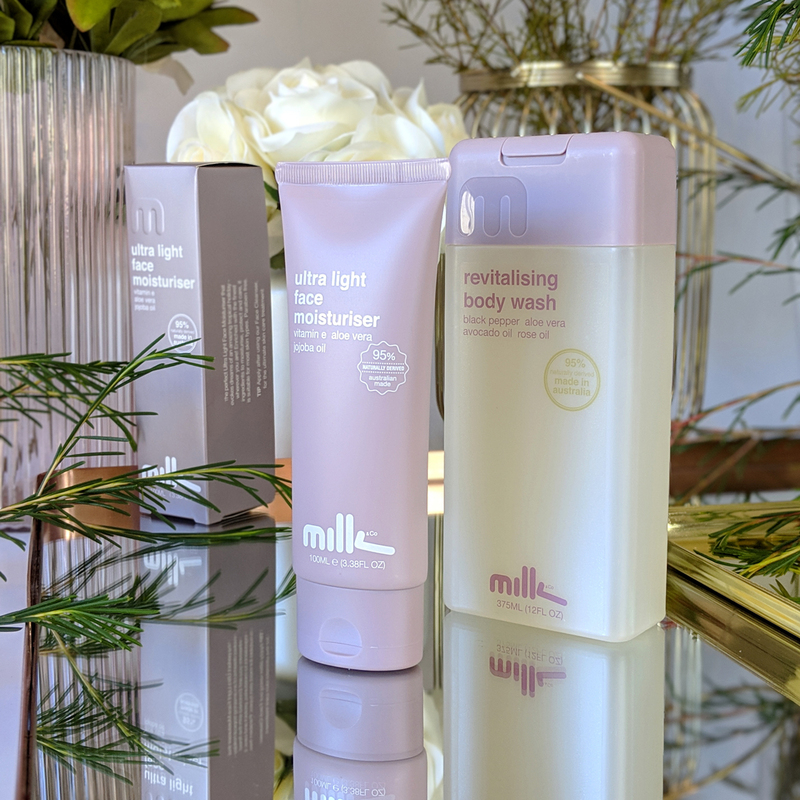 This luxurious Milk & Co Ultra light Face Moisturiser offers a deep dose of hydration while delivering bright and radiant skin. I have been using it day and night as it absorbs quickly into the skin, leaving it looking healthy, renewed and youthfully radiant. Enriched with the finest ingredients including Jojoba Oil, Vitamin E, Aloe Vera extract plus Marine extracts of Nori and Spirulina. With more than 50 different nutrients such as amino acids, minerals and essential fatty acids, my skin drinks it all up and loves it. So there you have it, my first blog post for 2019. Here’s to many more awesome chats, beauty reviews and fun content. Stay tuned for a cheeky DIY containing essential oils next. Which Australian beauty products have you been loving this year? Is there anything you recommend I add to my cart 🙂 Let me know in the comments below. I haven’t tried either of these brands, but the LUMA Illuminating Primer sounds amazing! Good luck with your new business! 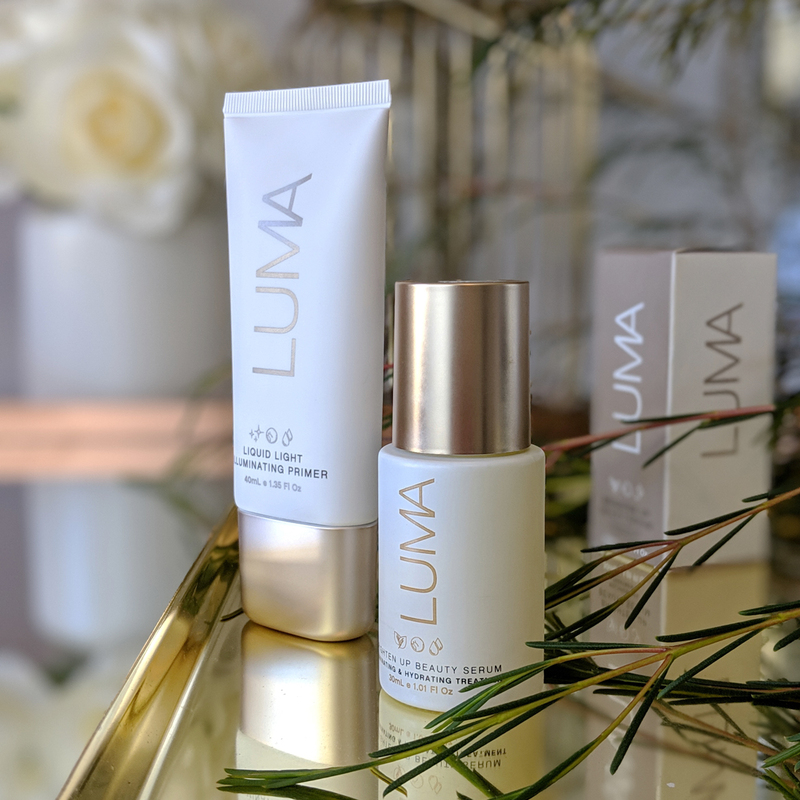 Love Luma products – must try the oil! I love the look of Luma products, the packaging is so gorgeous! 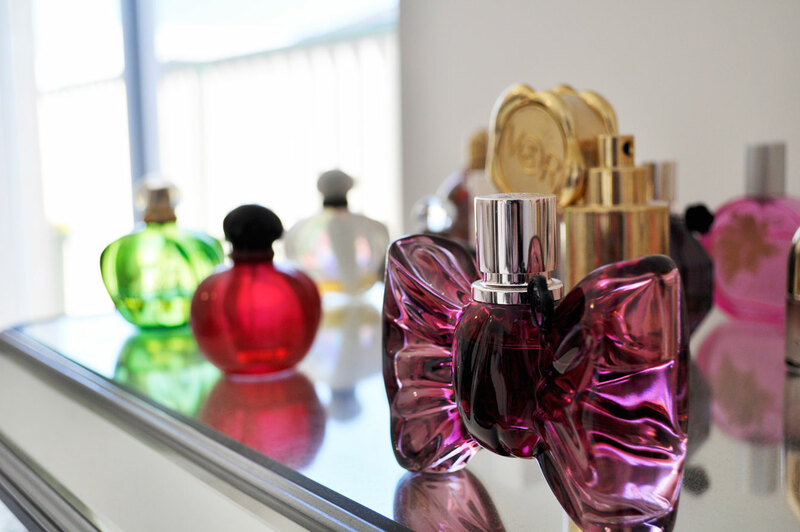 I might have to pick up some soon! Over here in the UK, we don’t have too many Australian products to choose from, but we do have Sukin, and I there are quite a few products I find amazing. Their charcoal face mask is very effective, and their night cream is one of the best night creams I’ve ever tried.